Wow! It’s been almost 3 long months since I’ve posted anything. The holiday’s have come and gone and nothing came from our kitchen. I’ve made new things and have them saved to post, but just haven’t found alone time to get it done. Or if I have alone time, I’m too tired to do anything but just sit. This was a great winter meal. The dumplings tasted so good. I’m surprised this hasn’t been made again!!! 1 To make the gravy: In a large (8- to 10-quart), heavy-bottomed soup pot or Dutch oven, melt the butter over medium heat. Add the flour and mix well to make a roux. Cook, stirring frequently, until the mixture is pale yellow and resembles fine, wet sand, about 3 minutes. 2 Whisk the broth into the roux a little at a time, allowing the roux to absorb the liquid before adding more (this will help prevent lumps). Add the salt, pepper, carrots, and celery. Bring the mixture to a boil over high heat, stirring occasionally, and then lower the heat and gently simmer for 15 to 20 minutes. Keep stirring occasionally and skim off any scum (Love Note 2) that rises to the surface. 3 To make the dumplings: Whisk the flour, baking powder, salt, and parsley together in a large bowl, and then cut in the butter using a pastry blender, two knives, or a whisk until it’s in small pieces. (Alternatively, you can use a food processor: Place the flour, baking powder, and salt in the bowl of a food processor. Pulse several times to combine. Add the parsley and pulse once or twice to incorporate. Add the butter and pulse until it is in small pieces.) I used a food processor. 4 Add the milk and stir or pulse once or twice to moisten the flour mixture. (Do not overmix or you will develop the gluten in the flour and the dumplings will be chewy.) Gather the dough into a ball. 6 To serve: Gently stir the cooked chicken into the pot with the dumplings, return the liquid to a simmer, cover, and cook for 5 more minutes to heat the chicken through. Using a serving spoon or tongs, divide the chicken and dumplings among soup bowls. Ladle the gravy over the dumplings and chicken, sprinkle with the parsley, and serve. 7 In a pinch you can use canned low-sodium chicken broth and a rotisserie chicken and still have a good meal. When you add the chicken, feel free to stir in any leftover vegetables you have lurking in the fridge, such as steamed broccoli or green beans or braised greens. 8 When simmering gravies or sauces that include flour, be sure you skim off any scum that rises to the surface with a large serving spoon or ladle. This scum contains proteins and fibers from the flour that can make a sauce gummy. Super easy to make. Some ingredients were left out as usual for the picky pallet. But it has great flavor and is truly filling. Hope your winter cooking is good for you all. Thanks for being patient as I’m trying to get into the groove of things. I haven’t been very good over the last year or so about making healthy choices, but I’m working on changing that. I’m trying to use my wedding as a motivator to get back into an exercise routine and to eat better. Scott and I went through some light recipes and each picked out some we’d like to try. Portion sizes are a bit of an issue too. When you’re making all this yummy food and there’s only two to eat it, it’s easy to just keep eating. So here’s the first recipe he picked, and it was a great choice. This was a hearty soup with a lot of color and flavor. Even though I probably could have eaten a second bowl I am proud to say I stopped at one and don’t feel like I missed out! Mix all ingredients until well blended. Shape tablespoonfuls into 24 walnut-size meatballs. Heat 1 tbsp olive oil in a large skillet over med-high heat; add meatballs and cook until well browned, about 6-8 minutes. Remove to a plate, reserving 2 tbsp of the drippings. Heat reserved drippings from meatballs in a large pot or Dutch oven over medium heat; add the onions, carrots and garlic. Cook 2 minutes, stirring; reduce heat to low, cover pot, and cook for 10 minutes. Add broth and bring to a boil. Stir in meatballs, beans, pasta, chard and oregano and reduce heat to low. Cover and simmer for 10 minutes or until pasta is tender, stirring occasionally. Whisk eggs with some of the hot broth; remove soup from heat and stir in egg mixture. Let stand covered until egg sets. Serve garnished with parmesan cheese. Yesterday I was looking over my food supplies and trying to come up with a meal to make that wouldn’t require me to go shopping. This was part laziness and part budgeting. Every time I run to the store for “just a couple things” I end up with a cartful of stuff. I decided I had the makings of a good chili, and for me you don’t have chili without fresh baked bread. That’s the way my mom always served it, and now that’s the way I like it. To go with my chili then, I made a loaf of Ciabatta bread which you can read about here. This chili was nice and thick and because of all the veggies and ground turkey it’s pretty healthy too. This recipe is not very spicy because I am not a fan of really spicy foods. I leave those to Patricia! Brown turkey with the onion and the garlic in a large pot over medium heat. Add spices, tomatoes, tomato sauce, broth, beans, veggies and mushrooms; bring mixture to a boil. Cover, reduce heat and simmer until meat and vegetables are tender, about 30 to 45 minutes. Season to taste with salt and pepper. I garnished mine with a little white cheddar cheese and my bread of course! 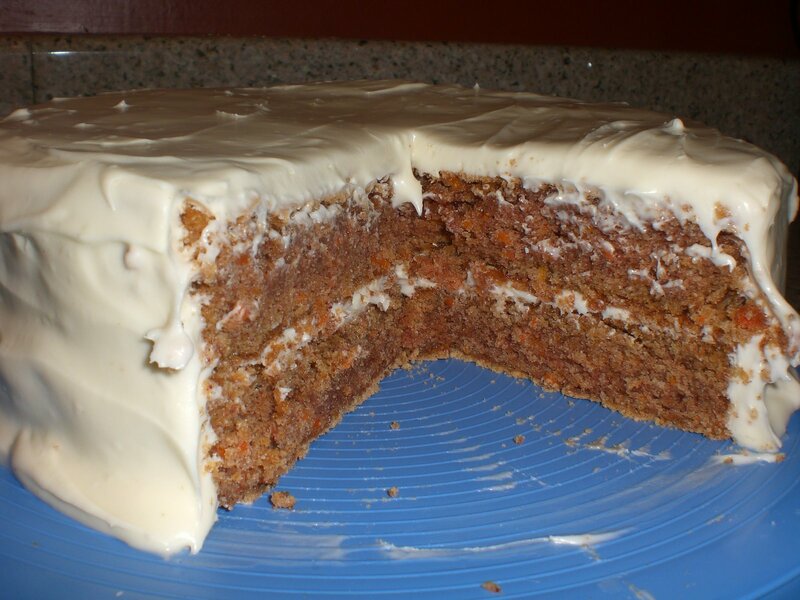 Bags of carrots were on sale buy one get one free, and Carrot Cake seemed like a great way to use some up. Enjoy! Combine eggs, sugar and oil in large bowl. In separate bowl combine flour, cinnamon, baking soda, baking powder, salt and nutmeg. Beat the dry ingredients into the egg mixture, then stir in the carrots. Pour into two greased 9 inch round cake pans. Bake at 350 for 35-40 minutes (or until a toothpick inserted near the center comes out clean). Cool for 10 minutes before removing from pans to cooling racks. Allow to cool completely before frosting. Beat ingredients with mixer until whipped. Assemble: Place one cake layer on your serving plate and spread with about 3/4 cup of frosting. Place the other cake layer on top of the frosting and cover the entire cake with the remaining frosting.